Sign in to Google with the account associated with your Google Assistant-compatible device (for example, Google Home Mini). Click Account settings and navigate to Integrations > Google Assistant. Click the Add Google Assistant action button. Select the Dynatrace environment you&apos;d like to be associated with your Google account and click Select environment. This can be changed later in Account settings > Integrations > Google Assistant. Optionally, navigate to Account settings > Integrations > Google Assistant and add tags to the filter inputs. 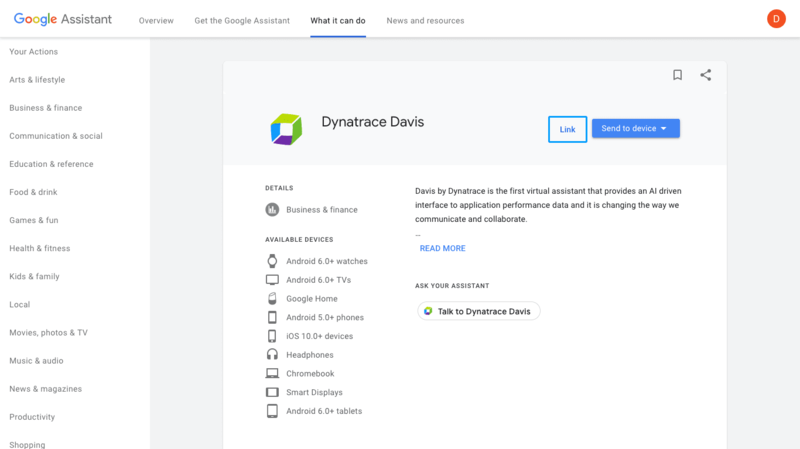 With your Google Assistant-compatible device nearby, say Okay Google, talk to Dynatrace Davis. You should now be able to interact with Davis Assistant. Optionally, you can add the Davis Assistant Voice Navigator Chrome extension to Chrome. 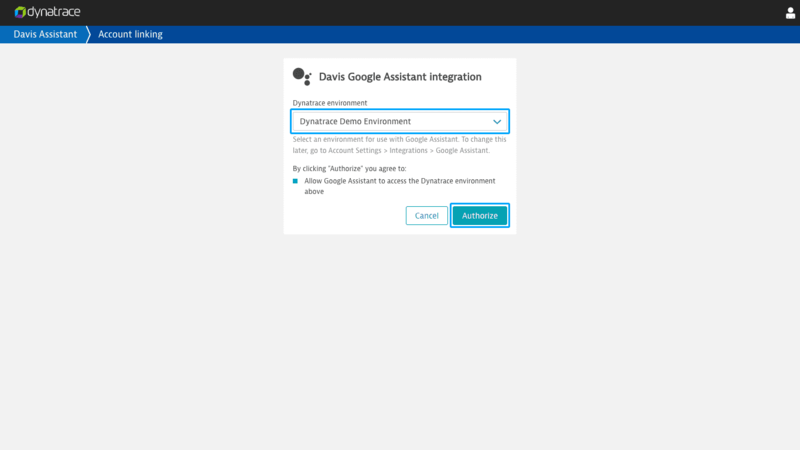 The extension allows you to view Dynatrace pages associated with interactions using the Davis Assistant Google Assistant action. 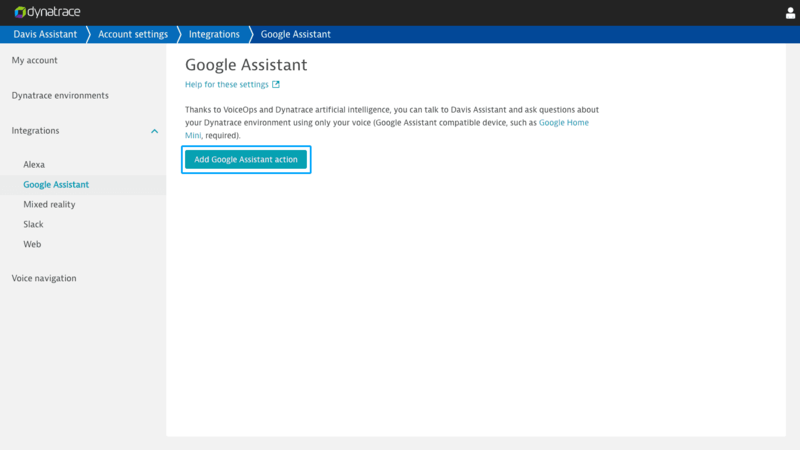 After adding the Davis Assistant Google Assistant action to the Google account associated with your Google Assistant-compatible device, you can start a conversation with Davis Assistant by telling your Google Assistant Okay Google, talk to Dynatrace Davis. Also, as a shortcut, you can immediately say a phrase or ask a question such as Okay Google, ask Dynatrace Davis what happened yesterday. Davis Assistant continues to listen for a few seconds after a response that includes an optional follow-up interaction. If Davis Assistant stops listening, you&apos;ll need to preface your next interaction with Okay Google, ask Dynatrace Davis. If you have a computer running the latest version of Chrome, you can optionally add the Davis Assistant Voice Navigator Chrome extension to Chrome. 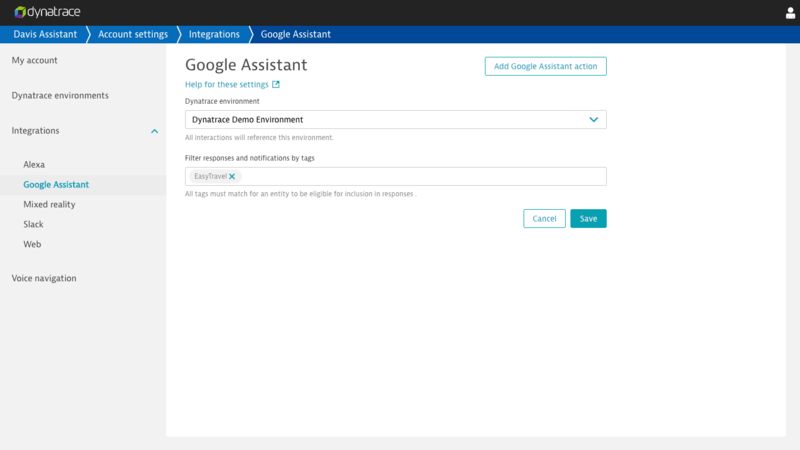 The extension enables automatic navigation to any Dynatrace pages that are referenced in your Davis Assistant Google Assistant action interactions. On davis.dynatrace.com, navigate to Account settings > Integrations > Account settings. Under Dynatrace Environment, select an alternative environment.